This restaurant was recommended to me by a Qatari coworker of mine. I had been hassling him for a while to tell me about some traditional Qatari restaurants so he finally acquiesced and told me of this place. Initially, he kept telling me that when he wanted Qatari food, he just ate at home, and only ate out at foreign restaurants. When he did tell me about this place, I was a bit shocked that to get Qatari food, you had to go to the Kuwaiti restaurant. He just brushed it off with ''It's pretty much the same exact thing.'' That's why I am grouping Khaleeji food all together. He was able to tell me of the general vicinity, but didn't know the exact location so it took a bit of exploring to find. One of the first things you learn about Doha is how hard it is to find places - using addresses is just starting to get widespread adoption. So one weekend, a South Korean coworker, an Egyptian coworker, and I set out to find it. We were lucky to have the Egyptian coworker with us. I had been studying some Arabic, and could read the name of the restaurant as well as translate it, but I am quite slow and can't read the name of every business on a road while in a moving vehicle. While driving down the road my Qatari coworker thought it may be on, at 30 miles an hour, my Egyptian coworker exclaimed all of a sudden, ''There it is!''. The name of the restaurant is only written in Arabic and is kind of hidden away. It is next to a Petra restaurant (review coming soon) that is much easier to find - so you can use that as a landmark. It is located on Al Shafi or Al Salam street (depending on the map consulted ... and yes, it is Doha so there are multiple Al Salam Streets ...) on the Northernmost edge near Al Rayyan Al Jadeed Street. Google refers to it as Garafat Al Rayyan and Dukhan Highway - but also refers to another road in the same area with the same name, so I doubt its correctness. The name bing uses translates roughly as ''The New Rayaan Street'', which seems much more plausible. The only reason I include this is to give you a taste of the fun of navigating through Doha. You should be able to see it on this map. If you zoom in really close, the Arabic word just North of it is the Petra restaurant I was mentioning earlier. Inside the restaurant, it is full of pictures of famous Kuwaitis and Arabs, but the rest of the decor is more standard. As with most restaurants in Qatar, there are rooms for women (so they can take off their veils to eat). Naturally being male, I never ate in any of them and just ate at a standard table. Their menu is only in Arabic, but has some pictures - so be prepared to point. Again, the first time I found the place was with an Egyptian coworker, so he was able to read the menu, though he didn't know what most of it was. He was able to converse with the staff and we got some good food. As is common in Doha, the staff did speak a lot of English, but it is tougher to get the more traditional food using English. 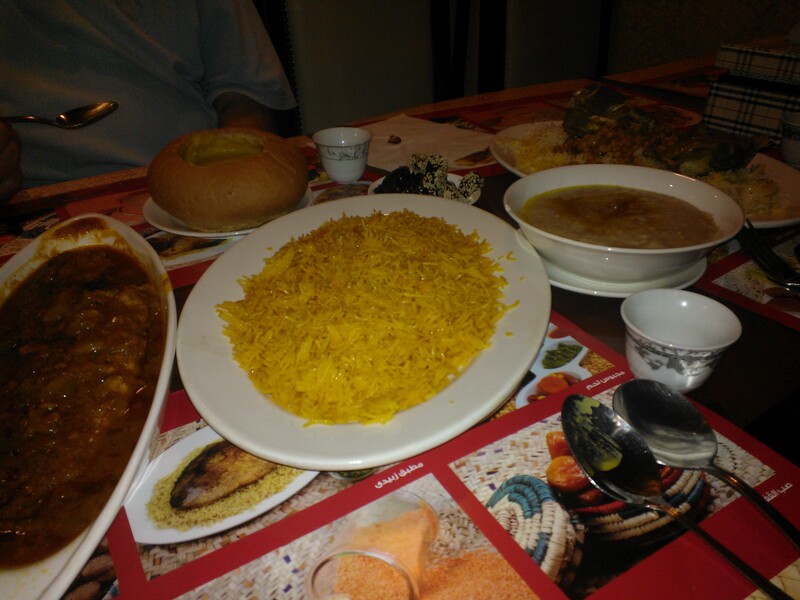 The Khaleeji Food at Bayt Al-Kuwaiti. Sorry about the quality. The hamour is the item on the left that looks like a stew. The harees is in the upper right in the bowl. In the far upper-right you can see the machbous (lamb). You can also see a lentil soup in a bread bowl and dates next to them (Sukary), some with sesame seeds on them. At this place, I particularly liked their Harees. This is a dish that many foreigners don't like. It is a grey color that is more of a porridge like substance. I think most of the dislike comes from the consistency. From what I have been able to find out, it is made from wheat, but contains bits of lamb, and is mixed with clarified butter. Some of the other good items that I had on their menu included Machbous (blog coming soon) and Samak Hamour (Local White Fish). We got the fish with some sort of sugary rice, but I'm not sure what it was exactly and could never explain it when I went back again. As I have repeatedly mentioned, finding this place online is tough, especially in English. I was able to find this one link to it on Qatar Spots. I was also able to check in on Facebook when I used the Arabic name, written in Arabic. Overall, this was one of my favorite places in Doha - especially for Khaleeji food, so I would recommend it highly. It is one of the hardest places to find for non-Arabic speakers, making it one of the most interesting places to go.